26 posts for the 26 letters of the alphabet. Today's post is brought to you by the letter 'R'. When I get to Z, I will draw the REread prize pack. To win it click here and get social. R is for 'rad' and also raspberries. 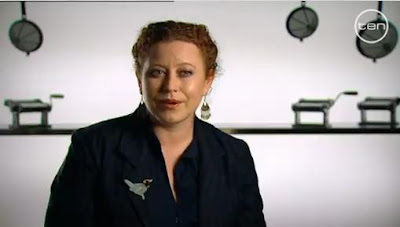 Firstly, the rad is due to one of my little bird brooches making an appearance on Channel Ten's MasterChef tonight ... woot! A very kind tweep alerted me to the fact that the bird brooch was on TV. Twitter, what a wonderful little social network. Now for the raspberries part. On Sunday we strolled down to the Jan Power markets with el doggo and had some breaky a coffee and picked up some sweet-as local raspberries. Oh nom nom! That night I made chocolate mudcake cupcakes with fluffy frosting, topped with fresh raspberries. Yum, yum, pigs bum is all I can say. If you're dead keen you can see it here in the first eight seconds of this clip.